1964 was an interesting year. Hollywood actors Nicolas Cage, Russell Crowe, Matt Dillon and Sandra Bullock first saw the light of day whereas Harpo Marx and the 31st President of the United States, Herbert C. Hoover, died. The Little Mermaid, Copenhagen’s landmark, was decapitated by unknown persons and Nelson Mandela was sentenced to life imprisonment. The Beatles continued to be very popular. With “A Hard Day’s Night” they released one of their most famous songs. Carl Barks had already been a most successful Disney author for more than twenty years. It was only a few years until his deserved retirement, but still no worthy successor had been found. William Van Horn was just 25 years old and, after a short time in cartoon animation, was still at the beginning of a great career which eventually would make him a Disney artist, too, 24 years later in 1988. However, things could have turned out quite differently. Already in 1964 Bill had sent sample drawings of the Ducks to Western, the Disney licensee at that time. 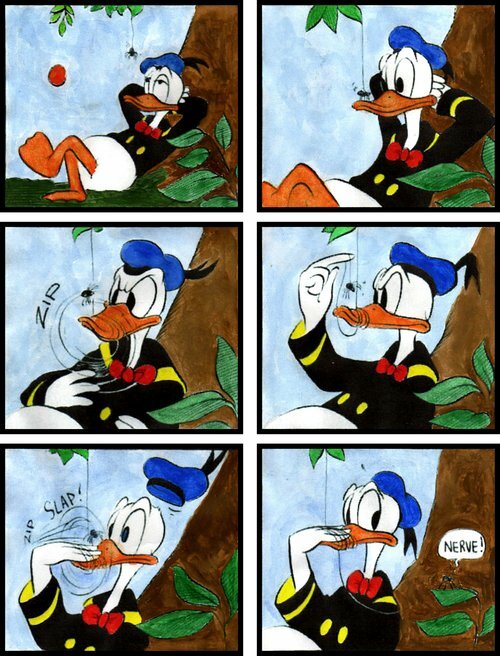 But the editors turned him down, not anticipating that the young applicant would become one of the most liked Donald artists a quarter of a century later. In the years to follow Van Horn worked very successfully for several animation studios before he published his first children’s book in the late 1970s. In 1985 Bill came up with his first own comic series, Nervous Rex. During these years Van Horn had acquired much experience how to build a plot and cleverly include funny situations and gags. Three years later finally the time had come for him to draw Donald and the other ducks. The pictured comic page from 1964 featuring Donald and the impudent spider shows quite well how much potential Van Horn already had in his early days. In addition to the spider gag Bill also made a page with Scrooge which, however, is lost. In 2003, 39 years later, Van Horn used the gag with the spider again for the cover of Walt Disney’s Comics & Stories no. 639. Illustration © Disney. Colored by Peter Kowalewski.